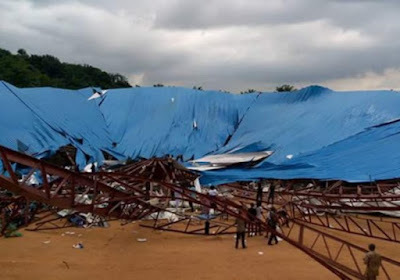 The Akwa Ibom State governor, Mr. Udom Emmanuel, was whisked out of the Reigners Church by his security personnel when the building collapsed, killing at least 90 worshipers with scores trapped in the rubble. Punch newspaper reports that the governor was attending the consecration of Pastor Akan Weeks as a Bishop on Saturday, when the church building collapsed. The Commissioner of Police, Mr. Murtala Mani, who confirmed the incident, said he could not ascertain the number of those dead or trapped in the building. “I don’t know how many people have died from the collapsed building or those trapped,” he said. The Secretary to the State Government, Mr. Etekamba Umoren, was said to have sustained an injury and was taken to an undisclosed hospital in the state. It was also gathered that the Chief Press Secretary to the Governor, Ekerette Udoh was also injured in the tragedy.